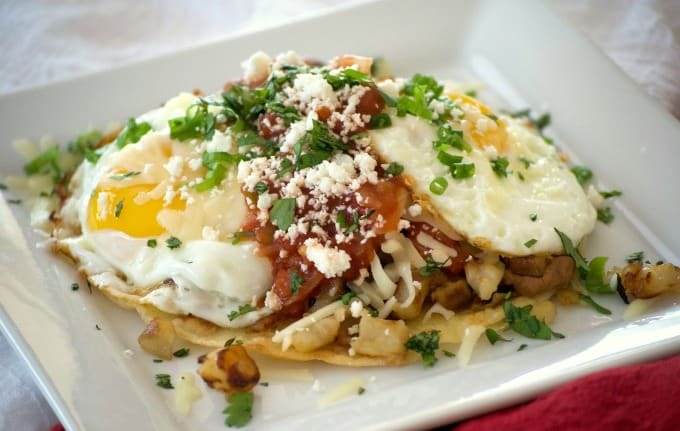 These Loaded Huevos Rancheros are a great start to any day. Lightly fried tortillas, refried beans, Potatoes O’Brien, salsa, eggs and cheese make this a hearty breakfast that’s full of great flavor! Breakfast is my most favorite meal of the day. Be it pancakes, waffles, scrambled eggs. You name it, I most likely love it. Oh, and you can’t forget the bacon! Oatmeal, smoothies. Although I haven’t tried a smoothie bowl yet. Those things seem a little ridiculous to me to be honest. Why put something of that consistency into a bowl when you can sip it out with a straw? And yes, I get that you put other stuff on top of it like coconut flakes, nuts and whatever that wouldn’t fit through said straw, but still! Pop those things separately into your mouth between each sip, for crying out loud. We like to go out to breakfast and when we do Kurt always, and I do mean always because he never orders anything else, orders Huevos Rancheros. Never pancakes, omelettes, waffles or an egg sandwich. Huevos. That’s it. I’ve never ordered it because I’m not one for runny eggs. They kind of gross me out. THIS RECIPE has changed all that for me. Seriously! I made this recipe for Kurt for Father’s Day and we all seriously LOVED it! It was SO very delicious, with great flavor in every single bite. I will definitely be making this again and again. It was quite filling and feel free to leave to omit the refried beans or the Potatoes O’Brien, but I have to tell you that each of those added so much to the dish. Serve these French Breakfast Puffs, Pear Cream Cheese Danish, or Brown Butter Rum Banana Bread along with the Loaded Huevos Rancheros. 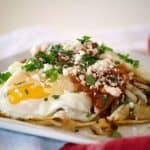 This recipe is slightly adapted from Simply Recipes Huevos Rancheros and this Speedy Huevos Rancheros. Loaded Huevos Rancheros are tortillas topped with refried beans, Potatoes O'Brien, salsa, eggs and cheese - a hearty breakfast that's full of great flavor! Note: this works very well if you have a person to help you with assembly, but it can be done by one person. Preheat oven to the lowest setting, and place six plates into the oven to warm - 4 four serving, one to keep tortillas warm. Cook 1/2 of the Potatoes O'Brien package according to manufacturer's directions. In a small saucepan or microwaveable bowl, heat of the refried beans. In a microwavable bowl, heat the salsa until warm. In a large skillet over medium-high heat, fry tortillas one at a time in one tablespoon of the oil, about 20 seconds per side or until lightly browned. Place onto a warmed plate in the oven with a paper towel separating them. 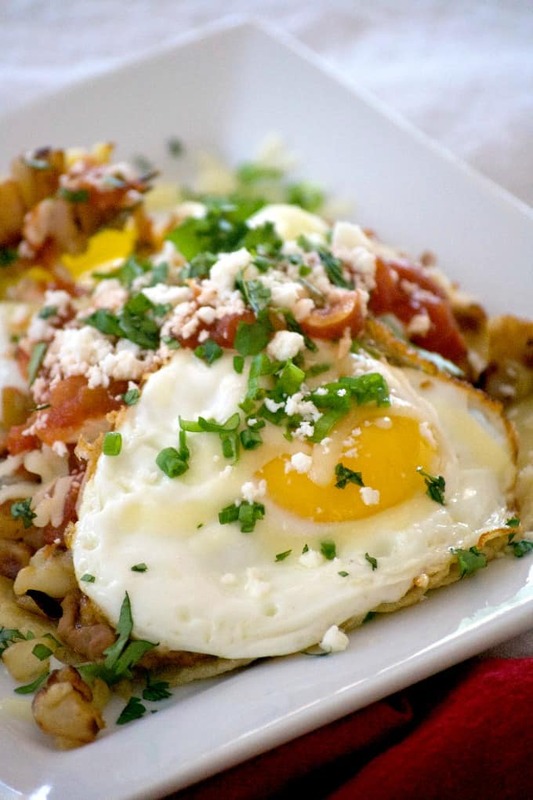 Once tortillas have been fried, reduce heat to medium low and add two tablespoons oil to the skillet to cook the eggs. Cook eggs two at a time for two minutes. Gently spoon some oil over the tops to set them. This cooking time with give you firm whites and the yolks will be runny when broken into. YUM! Place one tortilla onto a heated plate. Spread about 1/4 - 1/3 cup refried beans on the tortilla. Put 1/4 of the potatoes onto the tortilla. Sprinkle two tablespoons of the Monterey Jack cheese over the potatoes. Gently place two of the eggs on top. Cover with two additional tablespoons of salsa and sprinkle with some more Monterey Jack cheese. Top with green onion, Cotija cheese, and cilantro. Place prepared plate into oven and repeat process. Keep completed plates in oven until ready to serve all. These Breakfast Quesadillas would be perfect with your Mexican breakfast theme. How delicious would this French Press Breakfast Chocolate be to drink with it, too? Ok, it may not be Mexican, but it sure does sound super delicious! These Bacon, Egg Breakfast Tacos would be fun to make and easy to eat. This 4-Ingredient Fruit Salad will be a gorgeous addition to your morning table, too! It will be a fiesta for breakfast with all of these delicious recipes!